Do you wish you had a more beautiful smile? Do you have a tooth that is damaged, cracked, chipped, discolored or otherwise causes you problems? Restorative dentist Dr. Nabors and his caring, well-trained team offer several restorative dentistry procedures that can restore your smile, or create a smile you’ve always wanted! Bonding is a term that is commonly used to refer to the placement of composite resins on teeth. Restorative dentistry bonding can be used to make a tooth colored filling for small cavities and repair broken or chipped tooth surfaces. It can also be used to close spaces between teeth. These restorative dentistry procedures are usually accomplished in one appointment with little or no discomfort! Our restorative dentist, Dr. Nabors, can use bonding to take a rather lackluster smile, or one that has potential issues that could cause cavities, or teeth that already have cavities and restore them to make them fully functioning, beautiful teeth! Restorative dentistry bonding is sturdy, long-lasting, mercury free, and looks just like your natural tooth or teeth. You can laugh and smile with confidence as no one will know you have any bonding treatments. You can also eat and chew just as usual. CEREC® by Sirona Dental Systems is the world’s only restorative dentistry system for the fabrication of all ceramic dental restorations in one office visit. What CEREC creates are dental crowns in one day! 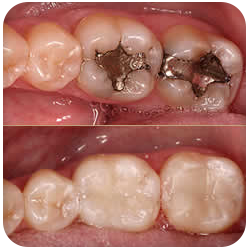 Typically, dental crowns as well as onlay (for dental fillings) and veneers took at least two visits. The restorative dentist would take a mold of your teeth, send the information to the lab to make the crown, the onlay or the veneer. In your second office visit, these dental procedures would be completed. With CEREC at your restorative dentist’s side, you can be in and out in a single visit with a permanent, all ceramic crown, onlay, or veneer! For you, the patient, this means fewer injections, less drilling, and less time out of your hectic schedule for dental care. Restoring smiles with restorative dentistry is something we are happy to offer to our highly valued patients. Restorative dentist Dr. Nabors and his caring, well trained team care about your smile, and about you!